The summer has finally departed. At least in terms of gigs anyway. We spent a lot of time driving crazy journeys to different castles around the country in our alter egos. Battle, Tynemouth, Harlech, Pendennis, Old Sarum – the car racked up quite a lot of miles last month! Then we had the amazing ‘Harpas at Halsway Nyckelharpa Festival. 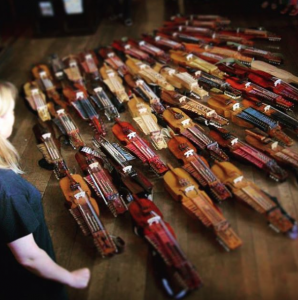 A record breaking 42 nyckelharpa players all came to my teaching weekend. I was quite moved. It’s been a long journey from when I first took up the instrument to this moments weekend. It was awesome! So now we’re back to normal for a little while, today has been doing some house maintenance before the winter sets in. Pretty much our only free day for a few months. 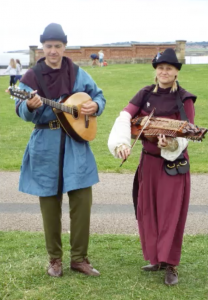 We have Smörgåsballad in Ely on Wednesday, standard folk duo in Bromley Cross on Friday and a festival in Douglas in Scotland on Saturday. Then it’s Tenkterden Folk Festival, I’m back in Germany tutoring and so it goes on…. all the while we’re preparing for our new album. We’re back off into the studio at WildGoose to record in November. Jonny has been creating some amazing guide tracks to work with so watch this space! Hope to see you somewhere on the road! Copyright © Swan-Dyer . All Rights Reserved.